Then I met you and the scent became unattractive. Now I don’t even know what to think. Birds are now silent for they’ve lost their melodies and daylight has gone into hiding giving birth to only darkness. But then you became the bitter devil I should’ve avoided. A war I have no chance at winning. I succumbed to my emotions. Maybe then I will have some closer. Hey guys sorry for my absence, been extremely busy with life and all. I recently got married and I am currently working on two unfinished manuscript. But I will be posting poems, Bi-weekly starting tomorrow. check my poem portrait video on youtube. please like, comment, share and subscribe. first interview since I wrote my book. ​i was interviewed by a Jamaican journalist by the name of Ashleigh Ann Mowatt. Check it out. 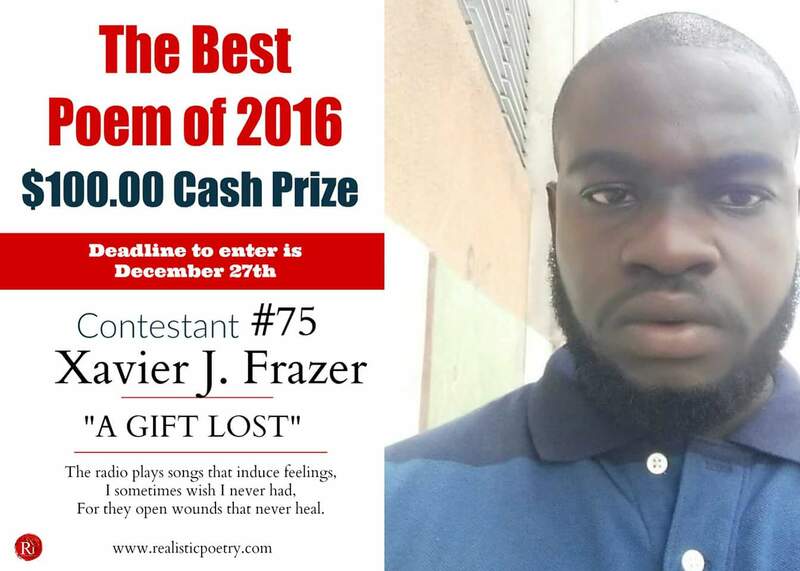 Good day fellow poets, scribes, wordsmith, master writers, family, friends, supporters and well wishers I humbly ask if you please could go vote for my poem ‘A GIFT LOST’ on Realistic Poetry International facebook page, as the image says I am contestant #75 Xavier J. Frazer. Once you get to the page all you need to do is like, comment and share the poem all of which adds up to one vote. Thank you in advance. For they open wounds that never heal. I thought of how you were the fire that melted my frozen heart, like butter in the sun. And how you left me speechless, yet full of laughter. I see people close their eyes to dream, with you I only had to open mine. When you looked at me my heart skipped beats, my eyes twinkle and your smile made me fall in love all over again. But your heart was as soft as wool. You were a beautiful disaster, like chaos really! Your smile dared me to fall in love. Yet the gift I naively lost. Soul Cry takes you on a journey. 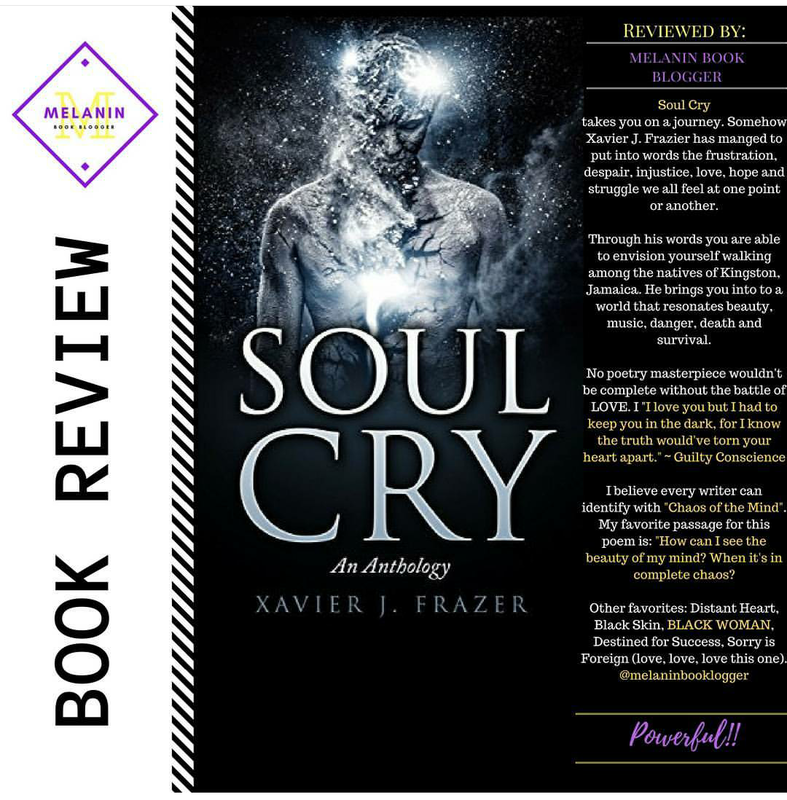 Somehow Xavier J. Frazier has manged to put into words the frustration, despair, injustice, love, hope and struggle we all feel at one point or another. Through his words you are able to envision yourself walking among the natives of Kingston, Jamaica. He brings you into to a world that resonates beauty, music, danger, death and survival. I believe every writer can identify with “Chaos of the Mind”. My favorite passage for this poem is: “How can I see the beauty of my mind? When it’s in complete chaos? Other favorites: Distant Heart, Black Skin, BLACK WOMAN, Destined for Success, Sorry is Foreign (love, love, love this one).